Katrina Kaif shoots for Arbaaz Khan's Pinch; to reveal some intimate details of her personal life? 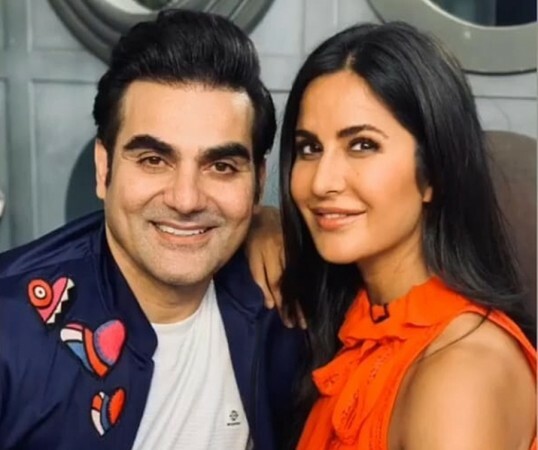 It would be interesting to see how Katrina Kaif would respond to Arbaaz Khan when he read out the nasty comments on her looks, her acting, her past relationships and her equation with other actresses. Even after going through a bitter break-up, Salman Khan has always been the go-to person to his ex-girlfriend Katrina Kaif be it from seeking career advice or making important decisions in life. As we know that Katrina and Salman will soon be recreating their magic and paint the silver screen red with their romance in Bharat, Katrina decided to stop by the sets of Arbaaz Khan's new chat show Pinch. Dressed in orange outfit, Katrina looked elegant as she posed with Arbaaz on the sets while shooting for an episode for the chat show which deals with online trolls. Talking about handling the negative comments on social media, the actress had earlier said that she takes the positivity and avoids the criticism and negativity. From getting criticised for being 'expressionless' to getting honoured with the Smita Patil Memorial Award to her past relationships and what not, it wouldn't be wrong to say that Katrina has been one of the favourite targets of the online trolls. And she has always chosen silence over retaliation which according to her is the simplest way to deal with negative comments. During the launch of his chat show, Arbaaz had said that Sunny Leone cried profusely when he read out a nasty comment about her on his show. So it would be interesting to see how Katrina would respond to Arbaaz Khan when he read out the nasty comments on her looks, her acting, her past relationships and her equation with other actresses. And would she remain calm and unaffected while revealing some of the intimate details of her personal life. In the previous episodes of Pinch, we saw how Kareena Kapoor Khan, Karan Johar, Sonakshi Sinha, Kapil Sharma and Varun Dhawan revealed what they feel about the negative comments written about them on social media. And now Sonam Kapoor will be next seen talking about how she feels when a particular person talk negative about her on a public platform.